Flogging the new book, but not a dead horse? Well the books are here, 400 plump pages in each one, fresh from the printers in Cornwall, boxed and shrink-wrapped and fork-lifted into the storage space, ready to be sent out again as feverish demand mounts. I wish, but we did ship out six boxes straight away to waiting customers and that number should grow over the next few weeks in the run up to Christmas, and with the various planned ‘launches’ and events. I earned more through direct sales last year than any other route to market, which is interesting but unsustainable, and I’m constantly looking for ways to increase sales through the regular bookshops beyond the reach of Hills of Workington, the Cumbria-based distributor that takes most of my stock. The other big distributors, Gardners and Bertrams, keep small publishers like me at something of a distance. We’ll have to pay them a big discount for the privilege of having them store my books ready for despatch. As it stands, they email us whenever they get an order and we send it off, one or two at a time, which is so wasteful and inefficient. With sales relatively low we’re just too small to be taken much notice of. These distribution issues, and the cost of storage, make the ‘ebook only’ alternative sometimes seem very attractive, but I still can’t bring myself to take that road and abandon the ‘book in hand’ altogether. I love books: ebooks are OK for travelling, but I love the feel of a book, the smell of it, the touch of a page under your fingers, the sight of the spine on the shelf or by the bed. So for the time I’ll carry on playing the real book publisher game and enjoy it, rather than berating myself for making less profitable choices. If you’re proud of what you’ve done, back yourself. Hopeful anticipation or more self-doubt? 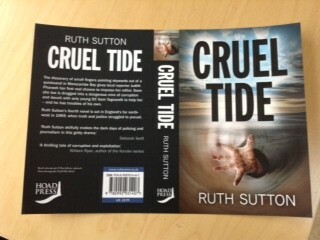 I veer between positive and fearful anticipation from hour to hour in this final run-up to the publication of ‘Cruel Tide’. Very occasionally I imagine what it would be like for it to be a runaway success, with sales off the scale and a rushed reprint. But most of the time I know I’m probably not doing enough to overcome the self-published author’s biggest challenge – getting people to read what you’ve written and created when there are so many other books out there competing for attention. I’m actually going to get a review for this one in Lancashire Life, the offer of which was unexpected, but what if they don’t like it? Perhaps the value of getting any kind of review is greater than the downside of a bad one. I’ve put out so many feelers, and so few of these get any kind of response that it can be very disheartening. I wonder if those who don’t respond understand the impact they have. Maybe they do, and just shrug. I wish I understood that world better and could handle it with more equilibrium. This general anxiety wasn’t helped this afternoon when I took an advance copy of ‘Cruel Tide’ to show to one of my strongest local supporters in her shop where she’s sold heaps of my books over the past few years. ‘Do you want to see it?’ I asked, preparing to pull my advanced copy of the book out of the envelope for the big reveal. She grimaced. ‘I’ve seen the poster, but I can’t look at it because I can’t bear hands.’ For a moment my heart sank. ‘I’ll sell it,’ she added, ‘and I’m sure the cover won’t bother anyone else, but I won’t be able to have it on the counter.’ What??? That’s a strong reaction: I know the cover image is striking, but it was meant to spark curiosity not revulsion. Surely someone would have advised against using the cover if it was that bad? Front and back covers, with the offending hand. Anyway, it’s too late now. The books are printed and the full shipment will arrive on Monday. I’m taking a copy through to Waterstones in Barrow on Tuesday and will see what a professional bookseller thinks. I hope she doesn’t have a hand phobia. There must be a special word for that condition, and I hope that it’s extremely rare. Beyond that the dates and events for presenting the book multiply, in libraries and bookshops all around the area. I’m grateful for all of them, and will enjoy them all too, but I wish I could break out into the wide sales uplands of Manchester or London. What would that take? Maybe I should just rock up to the huge Waterstones on Manchester’s Deansgate, book in hand, and tell them how lucky they are. That’s what I need – more chutzpah. Of all the stages of self-publishing the worst, for me at least, is the one I’m at now – waiting for the books to arrive from the printers. It’s too late to change anything, and I dread the possibility that I’ve got something wrong that will haunt me until the re-print. And I keep wondering, who is going to buy them, or will they languish in the storage locker until the covers curl? Everything’s down to me, and at this stage that means promotion, promotion, promotion : trying to get information out there so previous readers know that the latest book is ready. Can I persuade new readers to buy a copy and enjoy it so much they read the previous books too? I’ve spent most of the morning designing a flyer, knowing very little about how to do so, and hoping that it’ll serve its purpose. I ordered enough to leave in local venues, and take with me to the talks and meetings lined up for the coming month. On a smaller scale, this is the same calculation that you make about how many books to print – the more the cheaper, but it all costs. When does an enjoyable hobby turns into a financial gamble? ‘You have to speculate to accumulate’…yes I know that, but it still bothers me. At the back of my mind already are shreds of plot for the next book, and the current one isn’t even on sale yet. A wet walk along the coast from Whitehaven to St Bees yesterday filled my mind with ideas and images. Sometimes I feel I should break away from the local Cumbrian backdrop of my stories, but the sense of place is so strong that it keeps me in thrall. This is where I live and think and do my writing, and I’m not sure I could craft stories with any conviction about anywhere else, not yet at least. So for the next few days, until the new book arrives, I just worry. Will it sell? Will any reviewers like it? Will the characters be strong enough to sustain another story, or another trilogy? Is the timeframe I’ve set myself too tight? Am I loading too much pressure on myself, when I should be more relaxed and taking the days as they come? For a while, when I’m busy running around promoting the book in person the long term anxieties will move to the back of my mind, but they’ll still be niggling away in the middle of the night. Maybe the current fraught frame of mind stems from my recent long travels and jet-lag and will wear off. I certainly hope so!